Robert W. "Bob" Jensen, P.E. 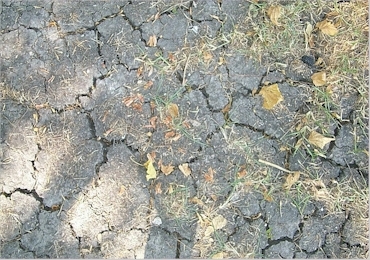 Soils of the North Texas area contain highly active clays which exhibit a high degree of expansion when wet and shrinkage when dry. This situation can result in severe vertical and/or lateral displacement of supported structures. Repeated variations in soil moisture content, therefore, cause differential movement and undue stress to structural elements of a building, resulting in unlevel floors, separations, drywall and masonry cracking and misalignment of doors and windows. Consistent soil moisture content is a key to controlling these problems. Maintain soil gradients around building perimeters by constructing ample slopes away from the foundation for a distance of three to four feet. Soil should be a predominantly clay material which is capable of shedding surface water; a sand, sandy loam or other porous material should not be used. A swale or drainage channel is normally included between properties. This feature should never be altered by addition of fill material or blocked by construction of landscaping, structures, etc. Soil levels against the perimeter beam should be no closer than two inches from brick ledge for a slab type foundation. With a pier and beam foundation, soils should be approximately halfway up the side of beams. Gutters and downspouts can greatly assist in implementing a moisture control program. Downspouts should have extensions with splash blocks to reduce erosion and should discharge onto the ground at least three feet away from the structure. Flower bed edging or curbs near the foundation may trap water. These beds should be filled with soil to prevent ponding or in some cases area drains may be necessary to discharge this moisture. Large trees or shrubs can consume tremendous amounts of water and should not be located near the foundation. When planting, locate trees from one to one and one-half times the mature tree height. Whenever cracking of soil occurs or soil is noted to be pulling away from the foundation, it is an immediate signal that soil moisture levels are too low. Water should be added in a slow, systematic manner using an automated sprinkler system and/or a soaker hose placed 18 in. from the foundation with holes facing downward. Water should be applied until runoff is observed. During hot weather, this process should be repeated on a daily basis - less during winter months. Remember that a consistent moisture control program will minimize soil movements, resulting in less structural stress and longer service life of the building.